Remember when some people were saying that Cody Kessler was better than Carson Wentz? During the 2016 offseason, the Philadelphia Eagles were in clear need of a franchise quarterback, and the incoming crop of college passers was thought to be a very deep and talented group. As you all know, the Eagles identified Carson Wentz as the cream of the crop, and made two costly trades to go up and get him. At the time, many Eagles fans did not approve of the expensive price to draft a Division I-AA quarterback from North Dakota State, preferring instead to draft a different quarterback later in draft without parting with other valuable picks. Obviously, the Eagles' strategy was the correct one, as Wentz led the Eagles to an 11-2 record in 2017 before tearing his ACL. Without Wentz's MVP-caliber season, the Eagles almost certainly would not have gained home field advantage throughout the playoffs, and then who knows how their season would have ended. • Jared Goff, Rams (drafted 1st overall): After a shaky rookie season, Goff finished with 28 TDs vs. 7 INTs and a YPA attempt average of a hair under 8 (7.98) in 2017. He finished fifth in QB rating and looks like a legitimate franchise quarterback that the Rams hoped they were getting when they made their bold move to trade up for him, like the Eagles did with Wentz. • Paxton Lynch, Broncos (drafted 26th overall): Lynch has just four starts in the NFL (1-3 in those), and he hasn't looked good, despite possessing a powerful arm and good mobility. The book on Lynch is that he has the physical attributes of a player like Wentz, but not the mental makeup. The Broncos thought so little of Lynch that they signed Case Keenum to a two-year deal worth $36 million this offseason. • Christian Hackenberg, Jets (51st overall pick): This was a terrible pick from the start, as Hackenberg should not have been drafted anywhere near the second round. He lasted two seasons with the Jets, before being traded to Oakland for a conditional 2019 seventh-round pick, and then was released by the Raiders three weeks later. Hackenberg is currently a free agent. • Jacoby Brissett, Patriots (drafted 91st overall): Brissett started two games for the Pats in 2016 when Tom Brady was suspended for cheating, and Jimmy Garoppollo was hurt. He came through with one win for New England. In 2017, Brissett was traded to the Colts for former first round wide receiver Phillip Dorsett. He started 15 games for the Colts last season, going 4-11 in those games with a God-awful Indy roster. Overall, Brissett looks like a decent NFL backup. • Cody Kessler, Browns (91st overall): Remember when some people were trying to make the argument that Kessler was better than Wentz? Oops. 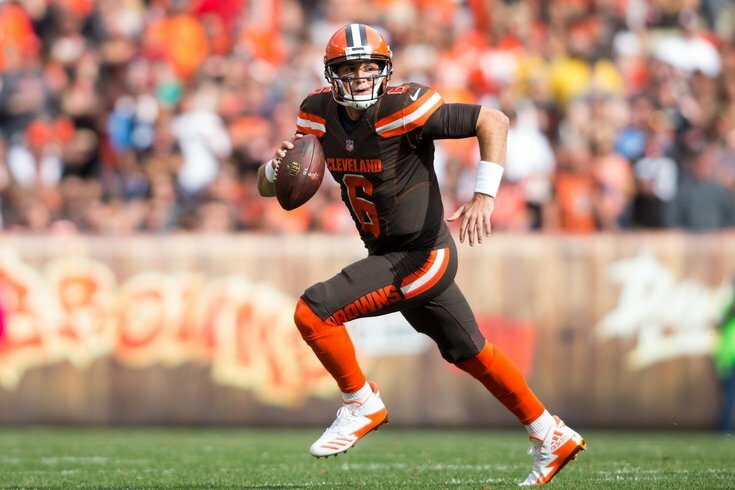 After some a few positive signs his rookie season, Kessler was beaten out by DeShone Kizer and Kevin Hogan in 2017, and was traded to the Jaguars during the 2018 offseason for a conditional 2019 seventh-round draft pick. • Connor Cook, Raiders (100th overall): Cook is behind Derek Carr on the Raiders' depth chart, but he got a chance to start in the playoffs in Houston against the Texans after the 2016 season. That went about as expected for a fourth round rookie making his first NFL start, as he went 18 of 45 for 161 yards, 1 TD, and 3 INT. Cook remains on the Raiders' roster. • Dak Prescott, Cowboys (135th overall): Prescott was a steal in the fourth round who won Rookie of the Year honors in a very quarterback-friendly offense in 2016, though his play fell off in 2017 when he needed to put the team on his back. Still, at an absolute minimum, Prescott is a legitimate NFL starter. • Cardale Jones, Bills (139th overall): Jones' NFL experience is limited to some Week 17 mop-up duty during the 2016 season. During the 2017 offseason, he was traded to the Los Angeles Chargers for a conditional draft pick. • Kevin Hogan, Chiefs (162nd overall): Hogan did not make the Chiefs' 53-man roster as a rookie, and he was signed by the Browns' practice squad. He was later promoted to the active roster, saw some action in games, and was actually effective to some degree as a runner, but not so much as a passer. During the 2018 offseason, he was traded to the Redskins (his third team) for draft positioning in the sixth round. • Nate Sudfeld, Redskins (187th overall): Sudfeld did not appear in any games as rookie with the Redskins, and was released at final 53-man cutdowns his second year with the team. The Eagles signed him to their practice squad, and he appeared in the Eagles' Week 17 game against the Cowboys in 2017, a game in which the Eagles were shut out, but Sudfeld went 19 of 23 (82.6%). Barring an unexpected trade, Sudfeld is a lock to make the Eagles' 2018 roster. • Jake Rudock, Lions (191st overall): Rudock did not make the Lions' final 53-man roster as a rookie, but he remained with the team on their practice squad, before being promoted to the active roster late in the season. In 2017, he beat out rookie Brad Kaaya for the backup job, appeared in one game and attempted five passes, one of which was picked. In 2018, he'll compete with Matt Cassel for the backup job. • Brandon Allen, Jaguars (201st overall): Allen has never appeared in an NFL game. The Rams kept him on their 53-man roster all season last year after being cut by the Jags, but he was inactive for all 16 games. • Jeff Driskel, 49ers (207th overall): Driskel was cut by the Niners as a rookie, and he landed with the Bengals. He has never appeared in an NFL game. • Brandon Doughty (223rd overall): Doughty spend most of his first two years in the league on the Dolphins' practice squad. This offseason, the Dolphins released him, and he was signed by the Cardinals. He has never appeared in an NFL game. And then of course there's "Draft Twitter" legend Vernon Adams, who went undrafted, had a couple tryouts with the Seahawks and Redskins, and is now on his fifth team in the CFL.